We’ve had so much fun sharing our Top Ten 6th Grade and 7th Grade math lessons with you, and writing this blog post was no different. The opportunity to see teachers and students engaging with each other, enjoying math class, and learning at the same time is what makes our work so rewarding. This is the last installment in our “Top Ten Lessons” series, and the 8th grade did not disappoint. The lessons our 8th grade users recommended showcase lots of difficult content students face in upper level math. Systems of equations, exponent properties, the Pythagorean Theorem, and understanding volume as a function are just a few of the topics these lessons cover. Make sure to continue Tweeting us and letting our Facebook Community know about all of the awesome learning that is happening with these lessons in your classroom. We especially love seeing pictures! The very first 8th grade math lesson to start off your year. Students become familiar with their geometry tool kits as they find ways to describe transformations in their own words. It is a great way to begin facilitating discussion and classroom norms. Students explore the proportional relationship between the height of objects and their shadow in this very interactive and hands-on lesson. It culminates with students going outside to use shadows to measure objects and then relate the length of the shadow and the height of the object as an ordered pair (x,y). Students build upon what they already know about solving equations to begin identifying ways to quickly determine if an equation will have no, one, or many solutions. Mathematical practices come to light as students make use of structure to find ways to quickly identify the number of solutions a given equation will have. This interactive card sorting activity encourages students to solve systems both graphically and algebraically. Students first match systems with their graphs before moving onto drawing their own graphs for a given system. 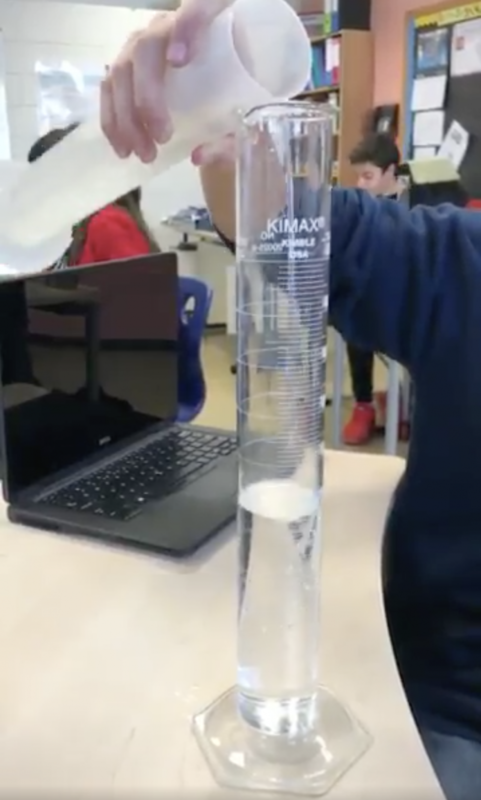 Students fill physical containers with water to begin making the connection that the height of the water is a function of the volume. This lesson is the first step in connecting what students know about functions to volume concepts they have not yet encountered. A genie and his magic coin lead students in a review on exponent rules from 6th and 7th grade. When the coin breaks and begins losing value students are pushed to think about fractional exponents and division. The interactive applet and visuals are a great way to review content while keep students engaged and interested. Students use what they already know about powers of ten to begin noticing patterns with negative exponents. This lesson includes a terrific matching activity that encourages students to construct arguments and critique the reasoning of others while matching exponential expressions with their equivalent repeated multiplication expression. In this lesson, students begin thinking about roots by estimating the side lengths of squares with known areas using their geometry tool kits and materials like tracing paper and rulers. There is also the optional activity in which students use either manipulatives or an applet to to find the area of unknown shapes using squares with a known area. 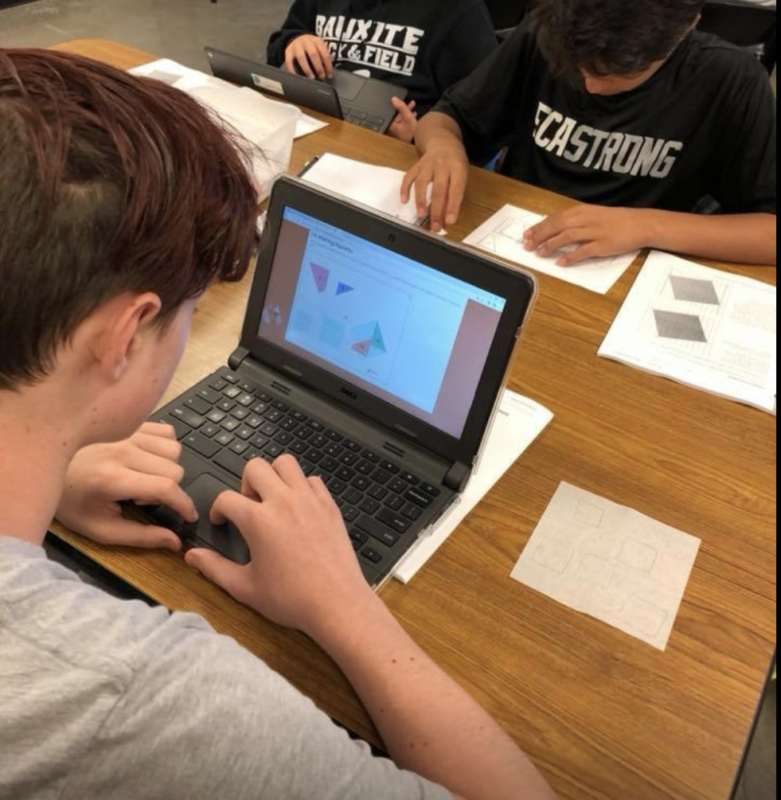 Students first work through a geometric proof of the Pythagorean Theorem, and then put it to work by using it to solve problems. An optional task also allows students to perform a transformational proof of the theorem. This lesson is a must for all 8th graders! Using what they already know about volume, students begin learning about cube roots by finding the side length of cubes. This lesson comes with a terrific card sorting activity where students match cubes and roots to their number line approximation. Make sure to take note of all your favorite lessons this year (along with your students’ favorites!) so that we can get your input on our best lessons at the end of the year. We would love to make our Top Ten Lessons list an annual tradition!